So I’ve decided to make some fairly drastic changes my to food over the next 12 weeks. My husband and I have signed up for a weight loss challenge that lasts 12 weeks…the winning team wins loads of cash and…we like money so…. We have been running regularly training for a 15k, however I have noticed that I have not been losing any weight. Since the exercise has increased so much, I can only assume that the reason I am leveling off is my diet. So, in an effort to lose those pounds…I have decide to embark on the vegan journey. I actually really love this way of cooking and eating and I am 100% up for the challenge. I know, the word vegan sounds HORRIBLE for most people. Who can live without meat and cheese!? Being from Oklahoma, I understand the feeling…if you take away meat and dairy, what else is there. The answer is…PLENTY! And I am going to share it with you. If this still sounds like too much for you…think of it not about eliminating meat and dairy, but increasing your fruits, vegetables and grains. You will find that these recipes are simple, healthy and very, very filling. If that STILL sounds like too much, I challenge you to take my vegan dish and add to it. There is nothing wrong with adding some shredded chicken or ground turkey to any of these recipes…or maybe you just want to add some crumbles of goat cheese. Whatever works for you, do it! But if you start with my recipes, you are guaranteed to have a healthy, nutritious meal. Are you up to join me on the veg-tastic voyage? Stay tuned for the first recipe, Shitake Mushroom Stir-fry with Rice Noodles! 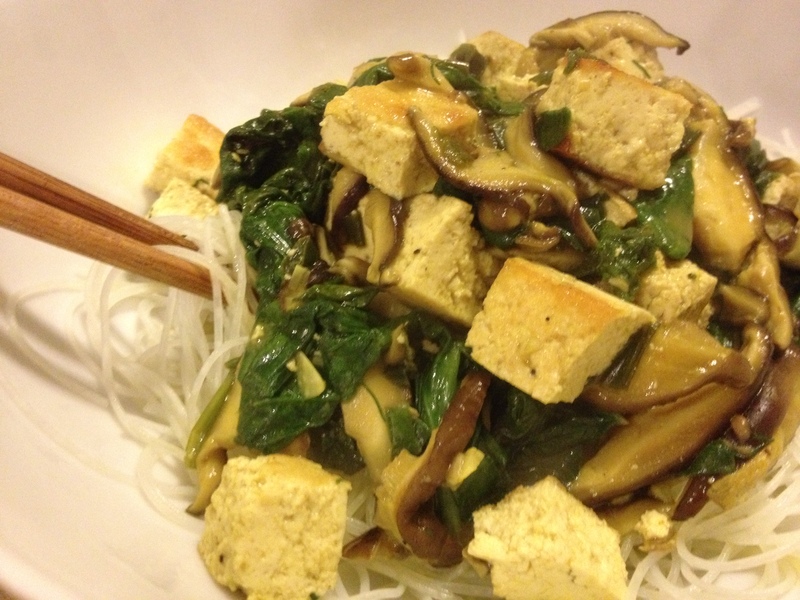 This can be made with crispy tofu, or chicken if you prefer. Great flavor and very healthy! Here’s to easy, healthy cooking! Posted on October 28, 2013 by stacycharnay	• This entry was posted in Uncategorized. Bookmark the permalink.